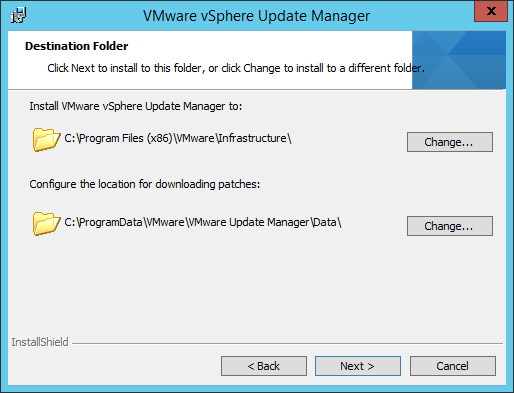 The new VMware vSphere Suite 6.0 brings several changes and new features, but the installation phases remain still similar with the previous versions. The big changes are in the vCenter deployment type both for the installable and the appliance version and the new VUM client… all the other parts of the installation remain similar with only few notes. 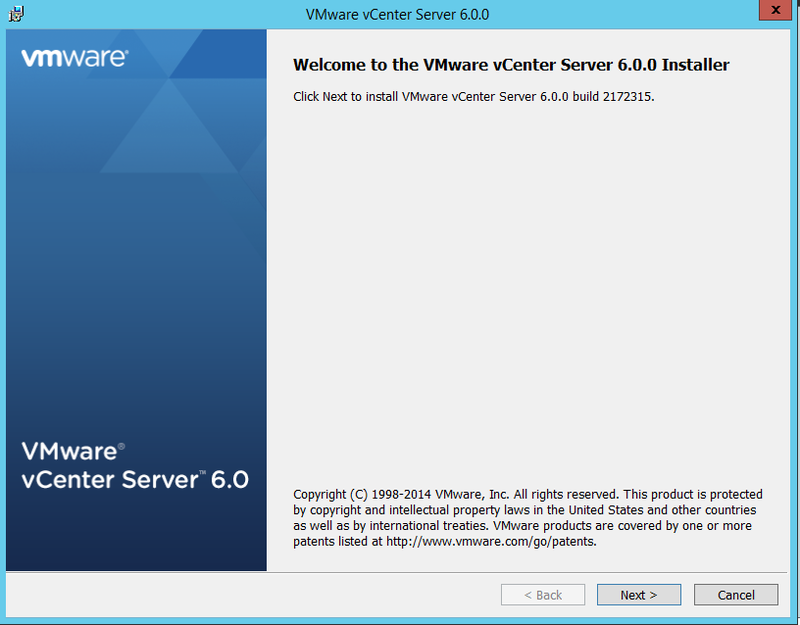 VMware vSphere 6.0 provides various options for installation and setup, similar for ESXi, new for the vCenter part. Note that the screenshoots are from the beta version, so maybe could change in the final RC. ESXi interactive installation remain the same and similar are the requirements and also the size of the ISO and the deployment options. Same remain the layout of the partition in the ESXi disk (for more information see this post about the partitions layout of ESXi) and you can still install in only 1 GB of space (little less due to partition layout). Although a 1GB USB or SD device suffices for a minimal installation, you should use a 4GB or larger device: the extra space will be used for an expanded coredump partition on the USB/SD device (see KB 2004784). Of course the will be a new Hardware Compatiblity List for ESXi 6.0, but conceptually you still need a 64-bit processor (after September 2006), with at least two core, support for hardware virtualization (Intel VT-x or AMD RVI) must be enabled on x64 CPUs and also the NX/XD bit must be enabled for the CPU in the BIOS. The minimum amount of memory is 4GB of physical RAM. If you plan to install in a virtual lab (you can use also VMware Workstation 9 or 10, not necessary the 11 version, or also ESXi 5.5) you cannot install with less than 3.9GB. The GA with 3.8 GB will just report that the memory is not enought, but with less memory could also appen that you will see generic error load in some modules during the bootstrap of the setup procedure… Or just stop in the “user loaded successfully” phase (with 2.5 GB of RAM). 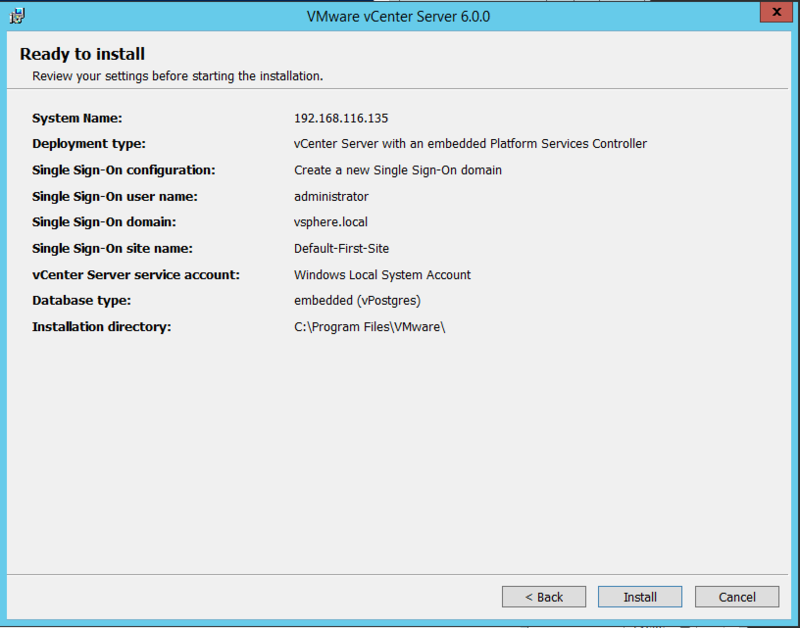 You can install vCenter Server on a Windows host machine, or deploy the vCenter Server Appliance. The vCenter Server Appliance is a preconfigured Linux-based virtual machine optimized for running vCenter Server and the vCenter Server components. 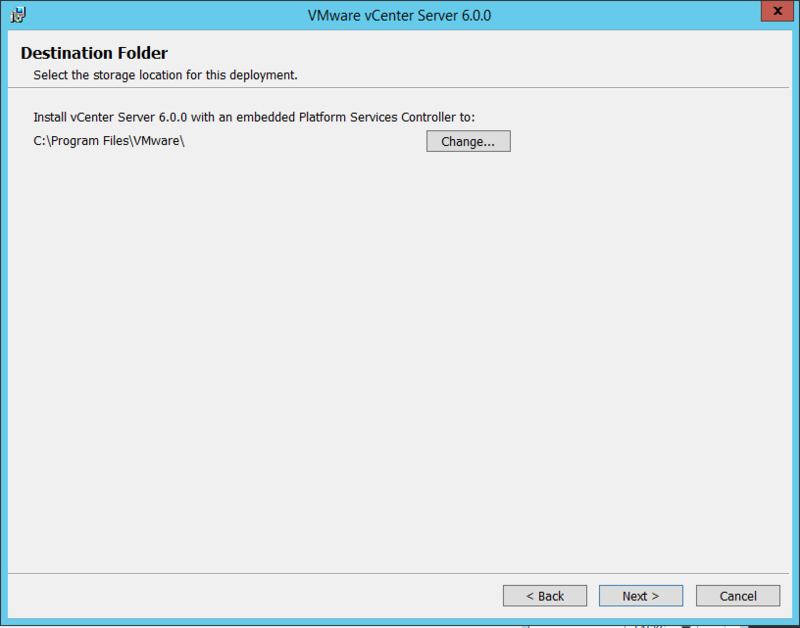 You can deploy the vCenter Server Appliance on hosts running ESXi 5.5 or later. The virtual appliance version is now fully comparable with the Windows installable version, and (from my point of view) it must become the first choice. I will cover more about it in a dedicated post. If you plan to deploy it in a lab with limited resource you must sadisfy the minimum requirement during the installation and after that you can try to reduce the memory (with 6GB it works, slowly, but it works). Real resource requirements depends on the size of your environment and the minimum are suitable for a tiny environment (up to 20 hosts or 400 VMs). The installation guide provide the correct numbers for CPU and memory for other size of environments. Note that althout the installation media is smaller from the previous version (at least for the Windows installable version), the required space for the Windows version is now 17GB minimum (due to the new components), so plan it carefully. If you deploy the Platform Services Controller on a dedicated machine, only 4GB of free space are required. There are different deplyment scenarios for vCenter Server, for more information see this post. In this post will be explained the simple installation (one single system) of the Windows version that could be scripted, or interactive and wizard driven (like in the previous version). Note also that starting with vSphere 6 all vCenter Server services such as the vSphere Web Client, Inventory Service, Auto-Deploy, Syslog Collector, Network dump collector, etc. 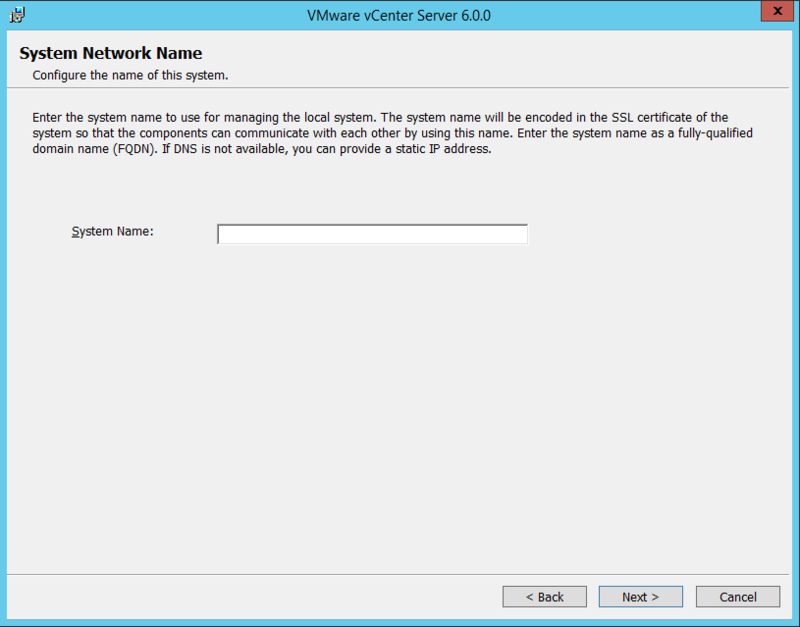 are installed on the same server as the vCenter Server. 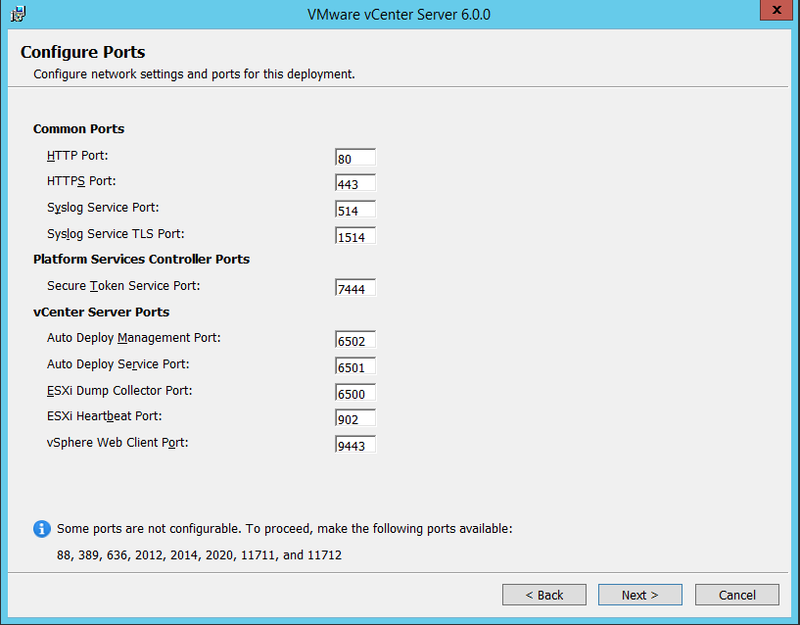 There is no longer a way to run these components on a different server from vCenter Server. 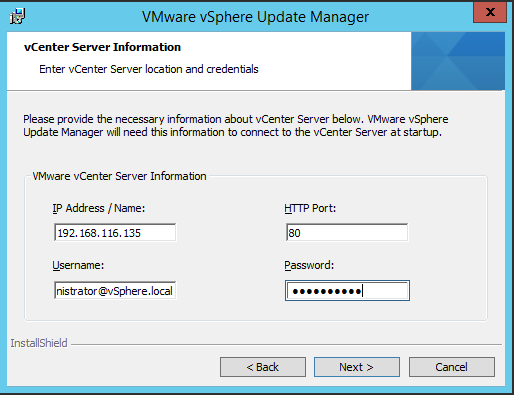 The exception to this is vSphere Update Manager (VUM), it is still a separate installation and can be installed on a different server, in the case of the vCenter Server appliance VUM must be installed on a windows server and registered with the vCenter Server appliance as VUM is a windows only service. Note that you cannot change the SSO configuration after the deployment and that the available option when you join a SSO to an existing one are the same of SSO 5.5 and define if you are implementing a multi-site or single-site scenario. Then you have to specify a database for vCenter: you can use external DBMS or and embedded one that will be Postres also for the Windows version (big changes compared to all the previous version of vCenter Server). You can also change the destination folder, but remember that past of the installation will still goes in the system disk (usually C:). Finally you will have a recap with all the choiches and you can now start the installation. Was nice have (in this window) a “show button” to see the right script configuration in order to repeat the installation exactly in the same way using an unattended installation. 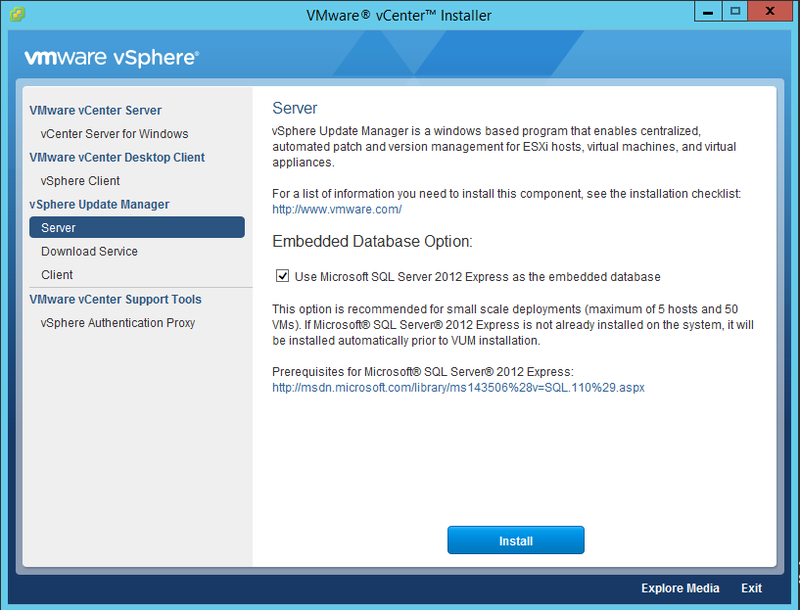 When the installation has finished you can launch the vSphere Web Client and start configuring your vCenter. Note that now is really a single installation, not multiple installation like the Simple Installation of vCenter 5.x where each steps will ask you something. 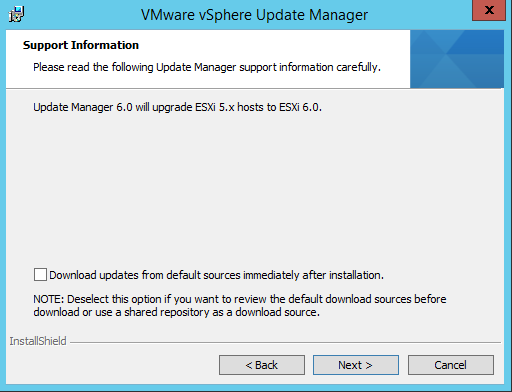 The VMware vSpere Update Manager hasn’t changed, in the server part, from the previous versions (it can manage the patches both for ESXi 6.0 and 5.x). It’s still a separated Windows components that can be installed in the same machine of vCenter Server (if it is Windows) or on a separated (not necessary dedicated) Windows machine. 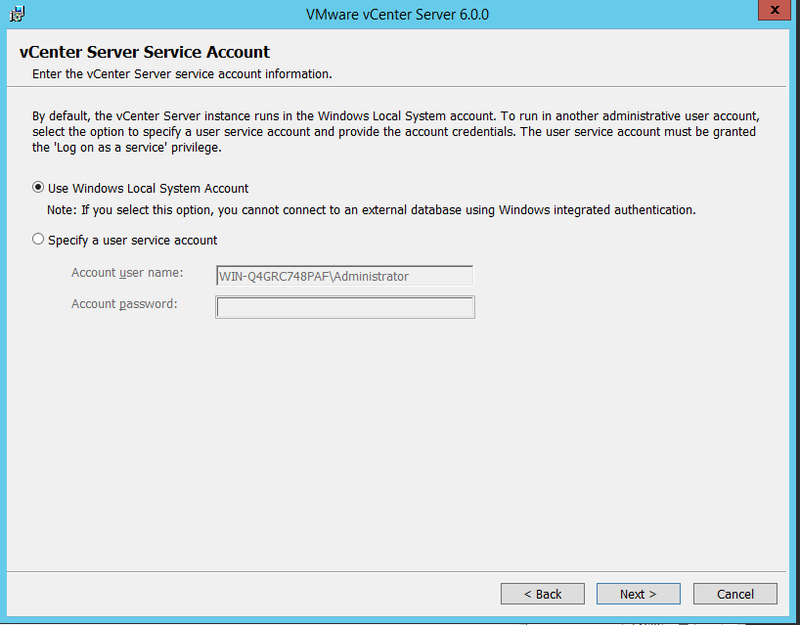 If you choose to use the embedded database, the installer will install a Microsoft SQL Server 2012 Express DMBS (also if you are installing VUM on the same machine of vCenter). Then you can choose the installation directories. Remember that the location for downloading patches will grow, so it could be useful in a real environment choose a different disk for it. After you have installed VUM, you need to install the VUM Client, introduced in vSphere 6.0, that is a new type of client, specific just for using and manage VUM (for more information see the previous post about the different vSphere 6.0 clients). 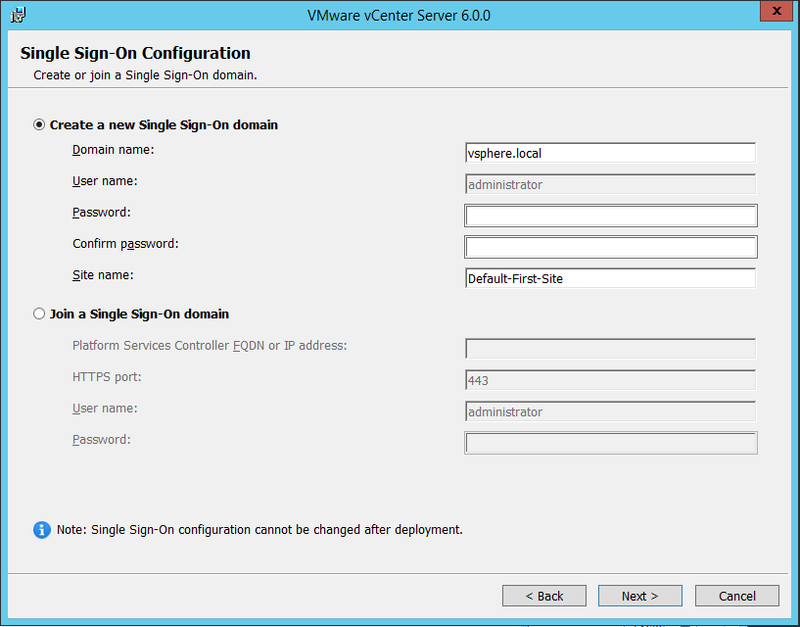 In the GA the VUM Client has become simple the common plug-in for the vSphere Client. For more information see also the vSphere 6 client’s post. 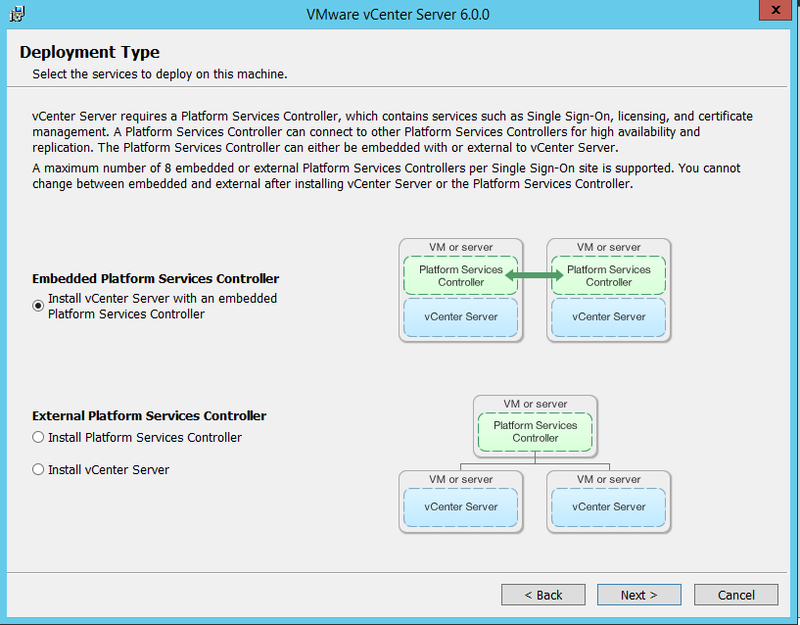 From the version VI 3.x the vCenter Server can be deployed or on a physical server or on a virtual machine (both solutions are supported by VMware). In this page pros and cons are analyzed. #1 | Written by Joshua Post about 4 years ago. For a lab setup, once vCenter Server Appliance is installed with 6 GB of RAM, can this be reduced even lower? I’ve only got 12 GB available in my current lab, and with VCSA taking up half, that isn’t much to play with. I’ve tried with 5 GB and it works… Would like to spend some time to see how squeeze it better (for example, by stopping some service that my be not used). #3 | Written by Mike M about 4 years ago. I’ll try that now and will let you know what’s come up. #4 | Written by Zsolt Pamuki about 4 years ago. Wow! 5 GB looks really good. I have to test this :). #5 | Written by Cor about 4 years ago. #6 | Written by Yuri Mendoza about 4 years ago. Great step by step details. 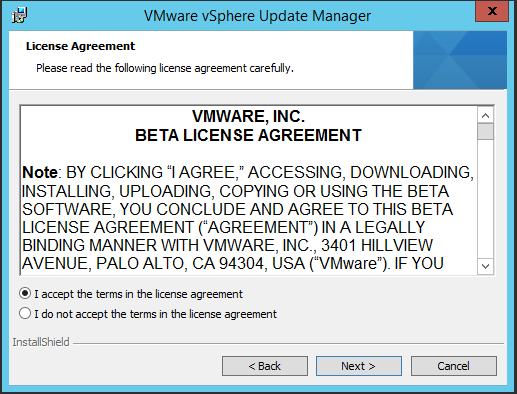 I like the fact the VUM is a separate client. I think that the next vsphere version will not have a c# client. just a separate client form VUM. #7 | Written by ScoZel about 4 years ago. Great article. Is the 17gb minimum for Windows 2012 R2? #9 | Written by Andrea Mauro about 4 years ago. 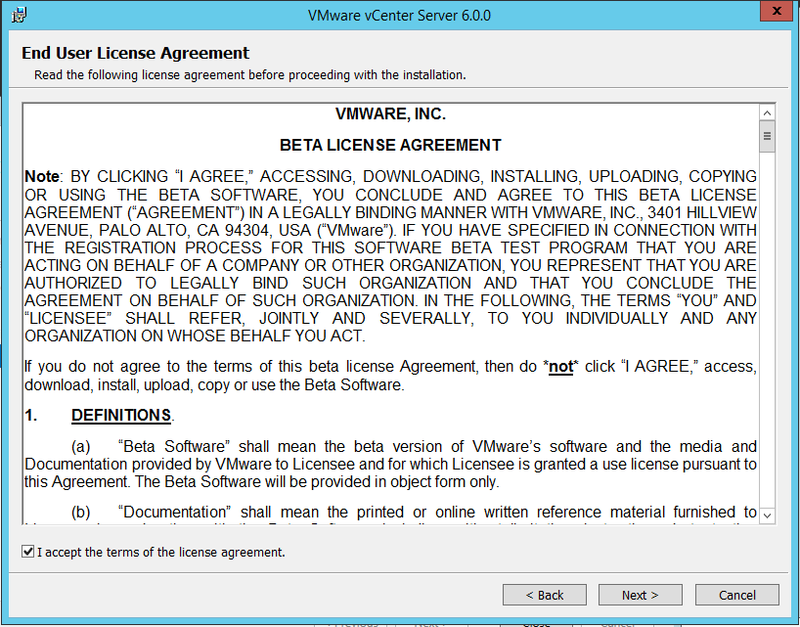 Yes… requirements was reported on the beta manual… May be slightly change in the RC. #10 | Written by Paulo Reis about 4 years ago. I would like to know if I have to upgrade to vCenter 6.0 before upgrade ESXI. 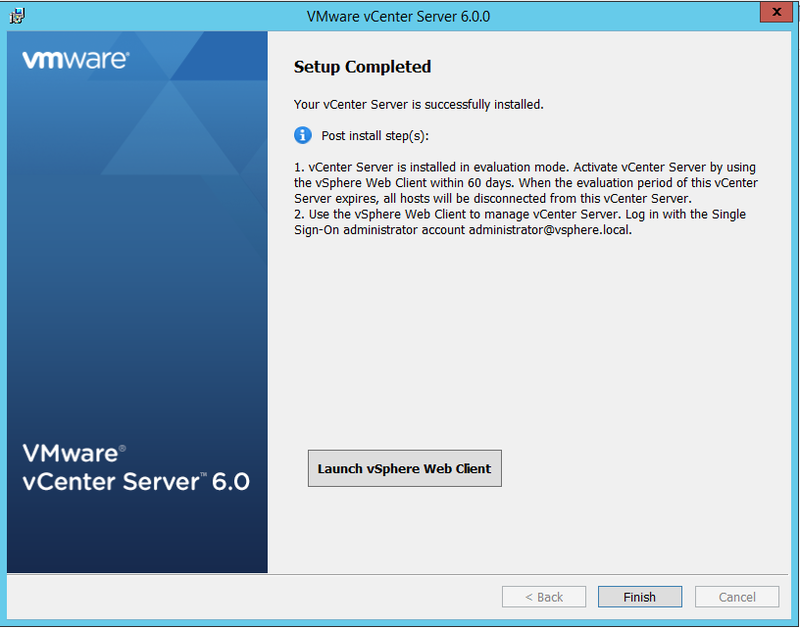 Today I am using vCenter server appliance and I would appreciate a post installing it. #11 | Written by Wojciech Marusiak about 4 years ago. #12 | Written by Mohamed Ibrahem about 4 years ago. 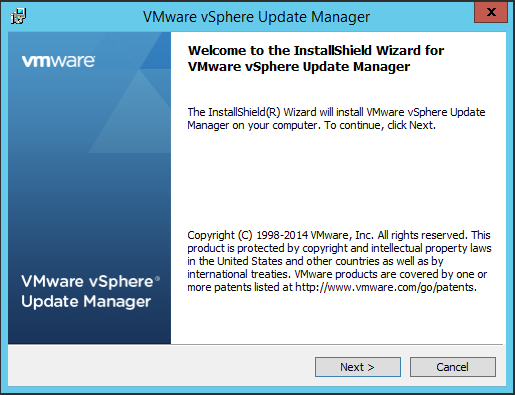 Great step-by-step VMware vSphere 6 – Installation. May I ask is the minimum hardware requirements at the installation time is different than at operating time ? #14 | Written by David Cain about 4 years ago. #15 | Written by Scott Clark about 4 years ago. This looks surprisingly non-scary for a major release. Looking forward to upgrading. #17 | Written by Syed Fayyaz Hussain Rizvi about 4 years ago. I would like to know if I could find some more information on min. resources like RAM, storage CPUs it can work based on your expertise and experience, as I want to deploy a test lab environment and I can not spare more of hardware for the purpose. Also if I could find some trail license links to download. #18 | Written by Andrea Mauro about 4 years ago. I’m going to write a post about it… But I prefer wait for the RC of vSphere 6.0 to be sure to give right (unsupported) mininum. #19 | Written by Nick Korte about 4 years ago. Great step-by-step, i’ll be using this when I set it up in my lab. #20 | Written by Stayfans about 4 years ago. Great informations! Easy as always, thx. #21 | Written by Timothy Matthews about 4 years ago. Thanks for the write up! Good to know that in lab environments, we can have a VCSA with 5GB of RAM. #22 | Written by Andres Rojas about 4 years ago. #23 | Written by Looneyduk about 4 years ago. #24 | Pinged by [VMware] news + interesting reads from the blogosphere: 09 Feb 2015 about 4 years ago.